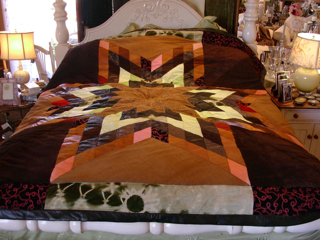 One of a kind Quilt, made from pieces of leather and suede in geometric shapes, abstract designs or symbols, such as animals, cars, planets, etc. This one is a star pattern made out of chevron shaped pieces. Each Quilt is different and unique. 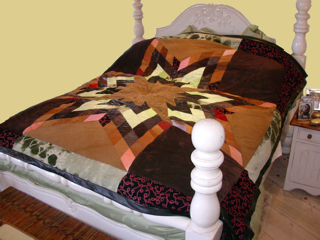 This one is backed with stripped faux fur in co-ordinating colors. Also offered in shearling and cowhide fur, in a wide variety of colors and textures and combinations. By Custom Order Only.